Bullet Stop, Inc. is located in Northwest Ohio's Ottawa County. 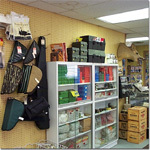 The shooting range and gun shop located just minutes away from Toledo, Fremont and Port Clinton. Every Tuesday is Ladies Day; ladies shoot for half price! Law enforcement officers are offered a special rate. Also, handicap fun leagues are offered all year. Contact Bullet Stop, Inc. for further details and times. In the future, a bowling pin league, bull's-eye league, and 22 junior rifle league will also be offered. Visit again soon for updates! Bullet Stop, Inc. is a member of the National Rifle Association, the Ohio Rifle & Pistol Association, the Ohio Gun Collectors Association, the Maumee Valley Gun Collector, and the National Association of Federally Licensed Firearms Dealers.